DOES EDUCATION MATTER? myths about education and economic growth, by Alison Wolf. Penguin Books, 2002, 332 pages. Policy makers of the right and left may differ over many things, but of one thing they are certain. Education – and here more seems to mean better – will be the key to success in the knowledge-based economies of the future. As a report to the British Parliament recently put it, “Learning is the key to prosperity. Investment in human capital will be the foundation of success in the twenty-first century.” And there is scarce a dissenter to this in the Western World. Whether we look at Europe, North America, Australasia or Japan, the trend in recent decades is inexorably in the same direction. Expenditure on education is increasing, the number of teachers growing relentlessly and in many countries, the percentage of students who enjoy the benefits of college education exceeds 50 per cent within their particular age group. The UK which, along with Japan, once practised a highly selective system to govern entrance to university now sends more than a third of 18 year olds to college. Even the indomitable Swiss have finally cracked. With a strong tradition of apprenticeship Switzerland fought a valiant rearguard action against the worldwide trend, but now has 15 per cent of school leavers registering for university attendance, almost double the level of five years ago. What could a doubting Thomas say who believed that the expansion of universities in the West had taken on a political life of its own, that perhaps governments had got it wrong here too? Until recently he had to hide his head below the parapet, but now all this may be changing. Alison Wolf, a professor of education at the University of London, has written a book which questions many of the assumptions behind the great education expansion and has injected a little iron into the soul of lonely sceptics such as myself. We should be clear on what the arguments in this debate turn. The more educated do indeed tend to earn more than their less educated compatriots and the economists of education even go so far as to correlate extra years at college with increments in income. But Professor Wolf wants to critically examine whether it was the time at college which made these high-earning people skilled. She also wishes to question whether if everyone had the same education as the high earners, they would have the same incomes and whether continual additions to the time spent at college will automatically add to GDP. Even the idea that education and economic success will be closely linked in the globalised twenty-first century is put under the microscope. It may be just as likely, she maintains, that we have over-educated workforces as that we need more graduates for the hi-tech future. No one doubts that in the modern world “having the right qualifications in the right subjects from the right institutions” matters. Whichever country you look at, the educated not only earn more, but they are also less likely to be out of work. But when employers hire graduates, might they just be looking for a method of ascertaining the ability of a particular candidate, not looking for particular skills? Wolf maintains that the answer to this question is yes. Education has become a socially acceptable method of ranking people. The better educated on the whole tend to be smarter and work harder, and hiring by credentials is convenient, legal and unlikely to lead to trouble. The billions of public money poured into education may have, from the economic point of view, resulted in a rather expensive method of job filtering. Employers are definitely looking for the most able people they can find. How long you stay on at school is closely related to how well you do at school, and years of education are correlated to general intelligence. In addition, years in education are a good indicator of motivation, perseverance and organisational abilities, all desirable qualities for the employer. If one indicator of educational success, such as a degree or an American high-school diploma encapsulates a whole package of cognitive and personality measures, the employer will be happy. Suppose, Professor Wolf says, “that everyone left school for good at the age of fifteen, or even twelve, instead of the modern habit of staying on longer and longer. Suppose too that, before leaving, everyone took some exams which provided a clear ranking of population. How much less productive would the economy, and most of these people, then be?” (p.30) One might be even more radical and question whether in the scenario outlined by Professor Wolf, with the billions spent on education returned to the taxpayers to spend as they wish, the economy might in fact be more productive. But I believe there is a spurious objectivity here. It is indeed possible to obtain figures for lifetime incomes, link these earnings to years spent at school and compute the costs of schooling in terms of private and public expenditures. It is further possible to calculate a rate of return which will relate the expenditures to lifetime income differentials. We may even then compare this rate of return to that obtained from non-human capital. But to establish the cause and effect relationship, to show that the income differential is the result of more education, is a rather different sixty-four million dollar question. A close correlation has been found between intelligence and years at schooling and a further correlation between the wealth of parents and the length of schooling of their children. In order to be effective, the rate of return calculations for education have to separate out and quantify such factors as these which might also explain income differentials. I do not believe that this has been done and indeed doubt if it is possible. There are further problems with income calculations which Professor Wolf alludes to. The concern with wage levels can mislead on the relationship between education and economic growth. An important condition for economic prosperity is a legal system which enforces contracts, and a legal system means lawyers – a conclusion you can’t avoid, try how you might. But one should be wary of linking lawyers’ salaries too closely with economic growth. The number of lawyers and the salaries they are paid might also have something to do with the volume of law and regulation in a particular society. To assume that because lawyers are well paid we should send even more people to law school to improve growth may lead to results the very opposite of which we wish. If it is difficult to ascertain the importance of education for economic growth by looking at evidence within one country, can we do better by comparing the experience of different countries. Here too, the experience is inconclusive. In 1980 Egypt was the forty-seventh poorest country in the world in terms of per capita GDP. Fifteen years later it was the forty-eighth poorest, though in the meantime the educational sector had expanded considerably. Just about the only thing that Egypt has in common with South Korea of late is that they have both expanded their education sectors. 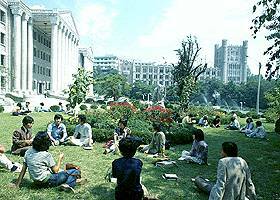 During the last thirty years, the South Koreans also took care to expand its economy. Although in 1979 it had a smaller proportion of its young people in university than Egypt, by 1993 that proportion was much higher. You can be South Korea, enjoy high economic growth and increase the educational sector or be like Egypt, fail economically and still expand education somewhat. Are university libraries the engines of future economic growth? Predictably, it is South Korea which is one of the favourite examples of development economists who wish to make the case for increased spending on education. But there are plenty of examples which run counter to their mantra. The Hong Kong education system did not have the central direction and planning of either Korea or Singapore – indeed many of the Hong Kong workforce were illiterate peasants who had fled across the border from China. Yet the Hong Kong economic growth rate over the last fifty years stands comparison with any country’s. Switzerland is one of the richest developed countries in the world but its educational arrangements are a cantonal, not a national affair, and the number of young people enrolled at Swiss universities is still way below the average in the OECD. The evidence of different countries across the world might just as well show that economic growth results in education rather than education causing economic growth. Professor Wolf refers to two American economists Mark Bils and Peter Klenow who offer an interesting test of this idea. The main argument of the advocates of education expansion is that education increases productivity and therefore the educated have higher wages. It is typically the case that as workers become more experienced and build up skills, they will earn more. This is the so-called ‘experience premium’. As we have seen, in many countries the length of time spent in education has increased for most young workers. Bils and Klenow therefore point out that if the additional education has improved productivity both in the short term (workers have less to learn when they start work) and long term (workers learn faster and more effectively), wage statistics should register the fact. We should expect the ‘experience premium’ to decline over time. Highly educated young workers should get paid more on entry to a job than previous generations did, but accumulate less of an ‘experience premium’ because they have less to learn. Moreover, those countries with the most rapidly narrowing premiums should grow the fastest as they benefit from the increasing number of well-educated young workers. Bils and Klenow were not able to detect any such trend and the size of the ‘experience premium’ seemed to bear little relationship to the growth rates of different countries. They were however, able to detect the phenomenon of the fast-growing economy encouraging and generating further schooling. And well they might. If education provides the certificates which are the recognised and legitimate route to economic success, children will want more of them, especially when they come with a hefty contribution of taxpayers’ money. But maybe the scepticism I have outlined above is ancient history and everything is different now? In the new economies of the twenty-first century, skills and flexibility are all and only education can deliver growth in the new ‘knowledge economy’. ‘Western economies have moved from manufacturing goods to manufacturing ideas’ – or so the purveyors of this turgid jargon would have us believe. What really will be the occupational structure of the new economies of the twenty-first century? The ‘it’s all different now brigade’ are right to point out that certain jobs such as that of the coal miner have all but disappeared across much of the advanced world, but wrong if they imply that all the new jobs will be ones requiring high degrees of skill. Professional and managerial jobs may have increased in number, but skilled and semi-skilled manual work has correspondingly declined. And make no doubt about it, low-skilled jobs still exist by the million. Two of the fastest growing jobs of the last decades were ‘care assistant’ in nursing homes and hospitals and answering the phone in call centres. As long as we continue to live in houses and apartments, travel to work and shop for a rich and varied array of goods, rest assured that there will still be jobs for people who clean streets and offices, operate supermarket check outs, pack and deliver boxes and sort out the plumbing. There are many reasons why people who do these kind of jobs might benefit from becoming acquainted with the novels of the Brontë sisters or starting a course in the Italian language, but none of them have anything to do with the education for growth arguments peddled by modern policy makers. As Professor Wolf dryly notes, “I find it difficult to construct a convincing argument that more …degrees are needed so that people will be educated enough to stack shelves, swipe credit cards, or operate a cappuccino machine effectively.” In fact, it’s probable that over-education (in the sense that people have developed skills which are not being used) is the norm throughout much of the Western World. In the UK, some economists have pointed out that large numbers of jobs demand qualifications from their holders which were not required in the past. Increasing the number of people with formal qualifications means that employers can insist on an applicant having more education and view with suspicion anyone without qualifications. The result is quite simply that jobs which once went to people who left school at sixteen or eighteen now go only to applicants who have degrees. Education has become a race where everybody is running faster and longer but, lo and behold, it is still true that only ten per cent of people can still finish in the top ten per cent. In this review I have concentrated on the criticisms of the ‘education means growth’ section of Professor Wolf’s book as I regard these as her most important and valuable contribution. Before I conclude, I should mention that she covers much more ground in her general discussion of the position of mass education in the modern world. She laments the fact that the increase in student numbers has reduced the average quality of university education and produced the famous ‘dumbing down’ effect. Yet, it’s a racing certainty that, if you have increased numbers of students going on to further education, the courses will have to be made palatable and passable for the majority of students. Otherwise you will have even more people dropping out of college, and in some countries this number has already reached eye-popping proportions. Professor Wolf points out that the efforts to expand the number of graduates has gone hand-in-hand with government financial stringency to make the entire enterprise feasible. She further maintains that there is an egalitarian thrust to the grand project and this has resulted in the elite universities being squeezed. I must part company with her here. Many of the best universities across the Western World have a growing private income and benefit from considerable donations by their rich alumni. The main sufferers from the large expansion of the education over the last fifty years are located outside – not inside – the education sector. The late Peter Bauer noted that foreign aid was largely the transfer of resources from the poor of the First World to the rich of the Third World. The present education system is in fact the transfer of resources from the poor of the First World to the rich of the First World. I will not end on a discordant note. That someone who works within the academic field of education should question the economic value of education speaks for a certain courage. That AlisonWolf should have done this in a book which is well argued and entertainingly written is better still. This book is a wake-up call to education policy makers the world over. Suppose, Professor Wolf says, "that everyone left school for good at the age of fifteen, or even twelve, instead of the modern habit of staying on longer and longer. Suppose too that, before leaving, everyone took some exams which provided a clear ranking of population. How much less productive would the economy, and most of these people, then be?" The concern with wage levels can mislead on the relationship between education and economic growth. An important condition for economic prosperity is a legal system which enforces contracts, and a legal system means lawyers - a conclusion you can't avoid, try how you might. But one should be wary of linking lawyers' salaries too closely with economic growth. The number of lawyers and the salaries they are paid might also have something to do with the volume of law and regulation in a particular society. To assume that because lawyers are well paid we should send even more people to law school to improve growth may lead to results the very opposite of which we wish. Switzerland is one of the richest developed countries in the world but its educational arrangements are a cantonal, not a national affair, and the number of young people enrolled at Swiss universities is still way below the average in the OECD. The evidence of different countries across the world might just as well show that economic growth results in education rather than education causing economic growth. As Professor Wolf dryly notes, "I find it difficult to construct a convincing argument that more …degrees are needed so that people will be educated enough to stack shelves, swipe credit cards, or operate a cappuccino machine effectively." Education has become a race where everybody is running faster and longer but, lo and behold, it is still true that only ten per cent of people can still finish in the top ten per cent. The main sufferers from the large expansion of the education over the last fifty years are located outside - not inside - the education sector. The late Peter Bauer noted that foreign aid was largely the transfer of resources from the poor of the First World to the rich of the Third World. The present education system is in fact the transfer of resources from the poor of the First World to the rich of the First World.